The Judge R.E.B. Baylor statue sits on Founders Mall, between Waco Hall and Pat Neff Hall. If you’ve been to the Baylor campus, chances are good that you have climbed into Judge Baylor’s lap for a photo opportunity. But it took awhile to arrive on that design—the statue was very nearly a standing portrait. (Imagine how different the photos would be!) In honor of R.E.B. Baylor’s birthday this week (likely on May 10), learn how this memorial to Baylor’s namesake came into being. Preparations for the 1936 Texas Centennial Celebration brought a variety of bright opportunities to the state’s Depression-ridden economy. Towns, counties, and institutions, anticipating a burst of tourism, prepared to attract visitors by capitalizing upon their historical figures and events; and many of the nation’s underemployed artists and craftsmen, aware of the potential commissions which such commemorations could engender, began scouring the state in search of work. To help them find employment, one of the federal government’s New Deal assistance programs appropriated funds in 1935 for disbursement by the Texas Centennial Commission of Control in payment for their work. Baylor President Pat M. Neff, ever alert to means of channeling outside funding into the university, was quick to recognize the possibilities of this federal largess. 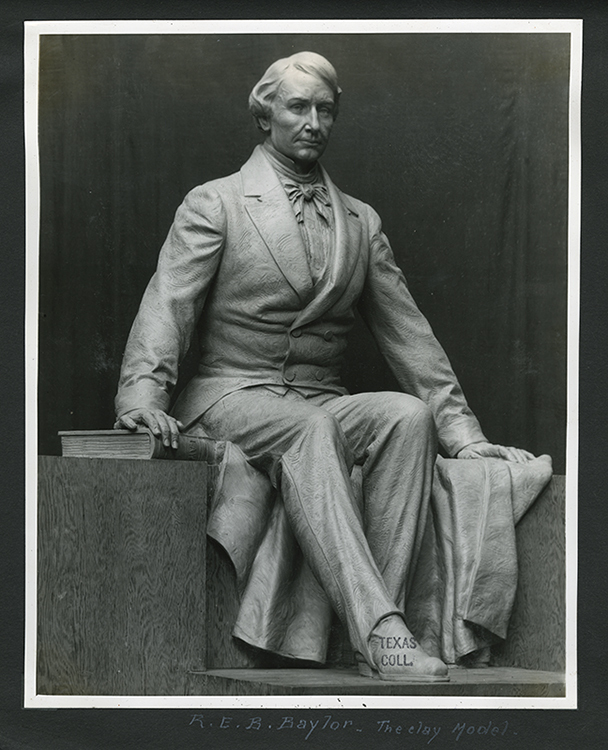 No substantial monument had ever been raised on Baylor’s campus to the school’s founder and namesake, Judge Robert E. B. Baylor, and Neff applied for and received a grant of $14,000 for the erection of a memorial to him. 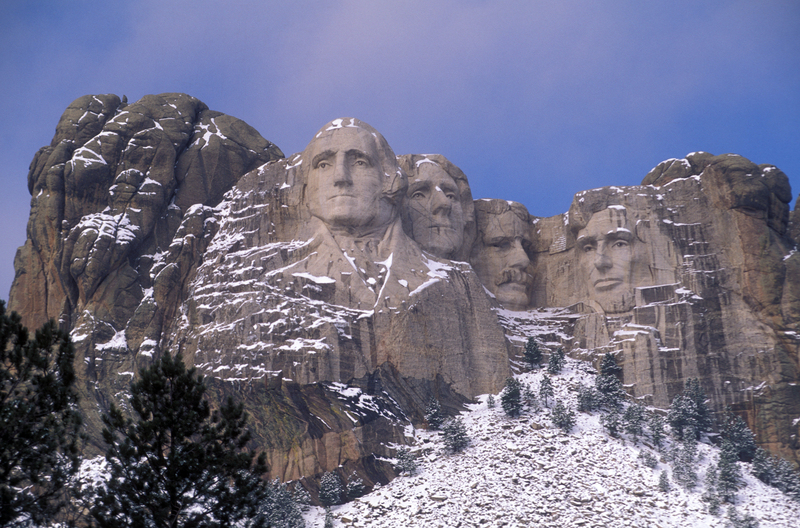 Did you know that the artist of Mount Rushmore, Gutzon Borglum, was considered as the sculptor for the Judge Baylor statue commission? Photo courtesy of TravelSD. On October 21, 1935, during a chapel service, he named a committee to decide upon the use to which the funds would be put….In addition to reaching agreement about the type of monument which they wanted, they had to select its location, view proposals submitted by sculptors, and recommend to the Commission of Control the artist best able to perform the work…. the committee’s first approval centered upon two proposals made by Gutzon Borglum, sculptor of Mount Rushmore. The more elaborate of Borglum’s drawings featured a portrait statue of Judge Baylor on a central pedestal, dressed in “a flowing robe of academic suggestion.” Flanking the pedestal at ground level were curved benches, on one of which reclined “the charming figure of a young man, reading,” while on the other sat a young woman “gazing upward as if entranced by the statue.”…The second proposal, favored by committee and sculptor alike, consisted of “a simple statue of Judge Baylor in the dress of the period,” with figures of a young man and woman in high relief on the pedestal’s sides…. Coppini’s clay model for the Judge Baylor statue. Pompeo Coppini papers #1490. The committee liked Borglum’s work, but he broke off contact with the committee to pursue another commission. In January 1936, they nearly approved a proposal by Chicago sculptor Leonard Crunelle (another portrait statue concept), but committee meetings ceased for about nine months, and then Pompeo Coppini of San Antonio came up. Coppini’s abilities were a known quantity on Baylor’s campus. One of his first commissions in the state had been the statue of former president Rufus Burleson, erected on Burleson Quadrangle in 1905…. At its meeting of September 21, 1936, the Monument Committee voted to request a proposal from Coppini, and the artist visited the campus shortly afterward. By July 1937, having received a firm commission to undertake the work, he returned to consult with the committee and settle final details…. Judge R.E.B. 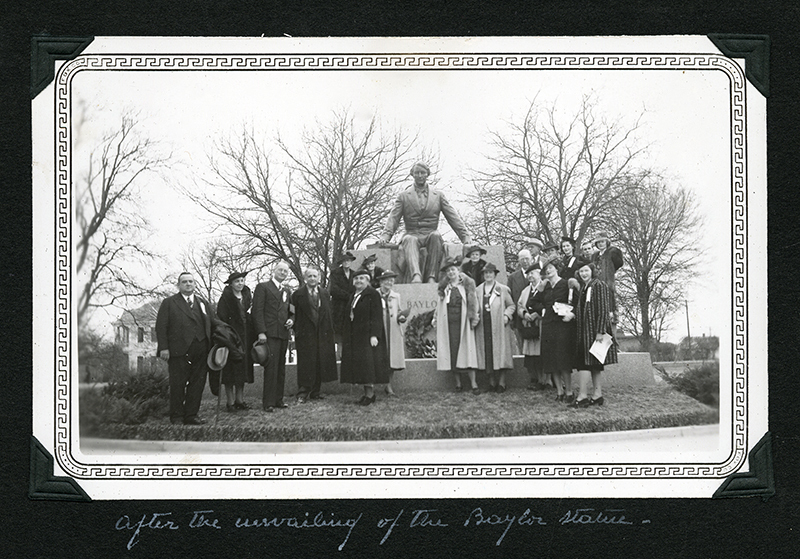 Baylor Statue, Baylor University, after the unveiling at the Founders Day dedication ceremony in 1939. Pompeo Coppini papers #1490. Coppini quickly decided that, for best lighting effect, the statue should face to the south, across the street from Waco Hall. Judge Baylor’s pose required more deliberations—a seated figure could cost more, but also would be more distinctive. The committee also discussed adorning the pedestal itself with bas relief figures symbolic of Judge Baylor’s interests in religion, law, and education, but then agreed with the sculptor on a simpler design. With all essential details decided, Coppini departed to his studio to design, model, cast, and eventually deliver the product of his own and the committee’s labors. 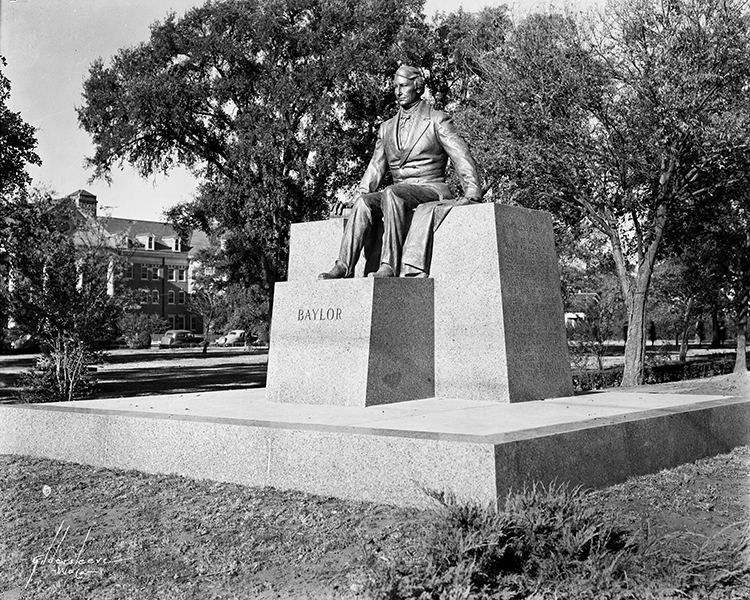 The completed statue of Judge Baylor, unveiled during Founders Day observances on February 1, 1939, was an immediate success within the Baylor community. This compilation of a two-part article by former Texas Collection director Kent Keeth was originally published in The Baylor Line in April and June 1984. Blogging about Texas periodically features “Looking Back at Baylor” selections, with hopes of sharing Keeth’s work with a new audience.